Zucchini bread always sounds amazing to me in theory. It seems to fall into the same category as banana bread (my favorite) and pumpkin bread (a seasonal must). Zucchini is also one of my favorites. Grilled, baked, raw, you can't really mess it up... with the exception of zucchini bread. Every recipe I've had is always overly greasy, sugary and seems to have very little to do with zucchini itself with the exception of making a fattening lard-loaf sound healthy. The over abundance of zucchini out there right now has finally pushed me to make a better (for my taste buds) zucchini bread. I don't claim this bread to be slimming but it's certainly less greasy and sugary than most. 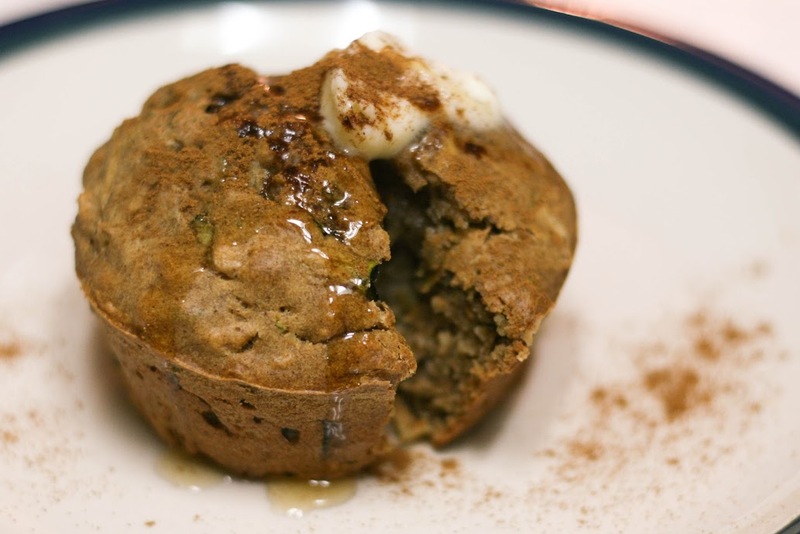 This recipe yield about 8 to 9 muffins and I baked them in my toaster oven because of the heat! They came out perfectly. Note: C denotes cup, t denotes teaspoon, T denotes tablespoon. In a large bowl beat the eggs. Add olive oil or oil of choice and cinnamon and continue to beat. Grate the apple and add it to the mix. Grate the zucchini (about 2 medium zucchinis) and squeeze to remove as much liquid as possible. Sift the dry ingredients together, add to the bowl, and mix until smooth. Pour the batter into greased muffin pans and bake for about 30 minutes or until a toothpick inserted into the center comes out clean and the top is golden. Serve with butter, honey, and cinnamon. Like Queen of Mayhem on Facebook!